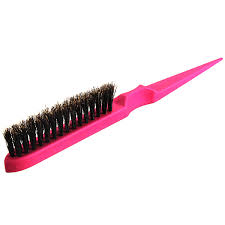 Yesterday, we discussed bristles. So, once you've decided on the bristle type, you now have a wide selection of brush shapes and styles. How do you make your selection. The style of brush depends on what you need the brush to do. Really, unless you repeat your same style daily, having one of each style lets you be creative and achieve the best results. Paddle Brush: this should be your basic, everyday brush. 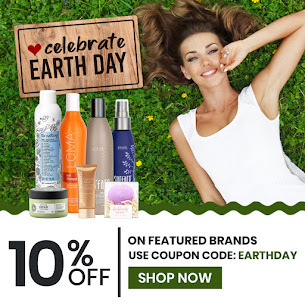 It helps flatten out frizz and creates a lot of shine. Vented Brush: Vents in the brush help speed up blow-dry time. The vents allow air to reach your hair strands from all angles. Using a vented brush when you blow dry also helps prevent damage since you spend less time blasting your hair with hot air. 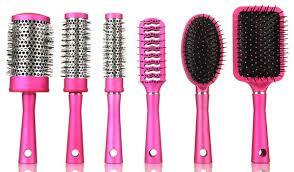 If you blow-dry your hair, you need a vented brush! Round Brush: When you want a ton of volume and a little curl, the round brush should be your selection. Round brushes come in a lot of different diameters...the smaller the brush, the tighter the curl. Before releasing the hair section your curling from the brush, give it a blast of cold air...it will help set the curl. Teasing Brush: Purposely created to help you create those little knots in your hair when you want extra volume in your up-do. Teasing isn't great for your hair, but if you use a teasing brush with boar bristles, it does a lot less damage than using a comb. Need to find the right brush or add the right brush to your grooming arsenal...click here! 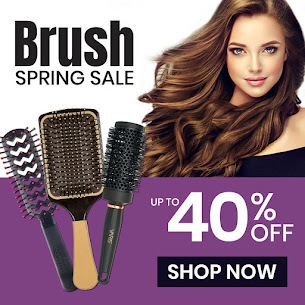 I like a synthetic bristle paddle brush since my hair is thick and very long. The other brush shapes just tangle it.